Reports of branch die back in many trees are coming into the Medina Extension Office from around the county. These brown patches are most likely the result of periodical cicadas laying eggs in the tender branches of trees. Cicadas prefer laying their eggs in young twigs about 1/4 to 1/2 inch in diameter. To lay their eggs, cicada stab a needle-like ovipositor into the branch that can cause these tender twigs to break, wither, and die. The resulting symptom is browning leaves at branch tips known as "flags" or "flagging". While larger trees have enough foliage to withstand tip dieback with little impact to their overall health, newly planted and younger trees have more twigs of the desired size, making them more appealing and at risk of more damage from cicadas. As noted in an earlier post by Jim Chatfield, fruit growers and nurserymen are particularly hard hit when next year's wood and fruit growth is at risk. Where periodical cicada populations were heavy, this flagging can be impressive. Specific reports have come in about branch damage on oaks, tulip poplar, ornamental pear, maples, blueberries, and paperbark maples so far. Over 270 species of tree, vine, and woody shrub have been documented as supporting the eggs of periodical cicadas. Oak tree showing declining branch tips from cicada oviposition. 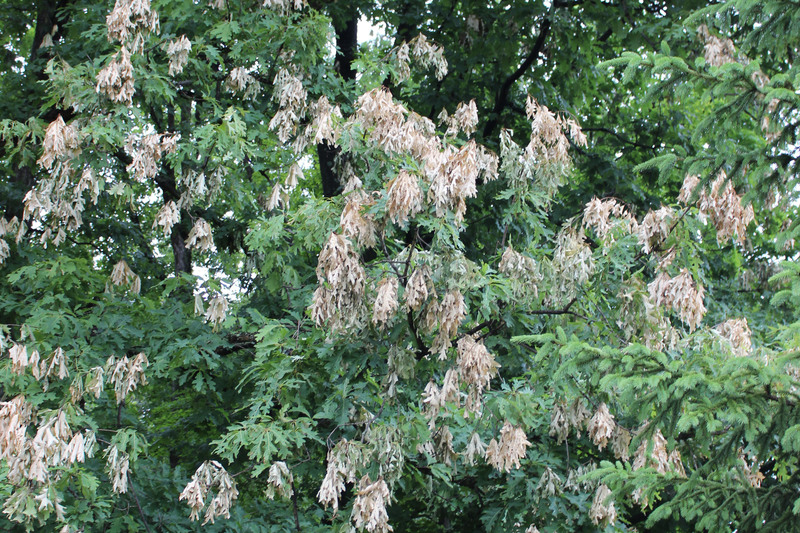 While this may be a common site during periodical cicada season, do note that branch dieback can be caused by other tree problems as well. To confirm cicada damage, check the branch behind the declining foliage and look for small slits in the branch where cicadas lay their eggs. If you have not seen or heard cicadas in your yard and are not finding oviposition scars in declining trees, more investigation may be warranted.